Special Features: Integrated Video Camera, Magsafe 2power Adapter Po Processor Type: Intel Core i5 4th Gen. Immediate payment of C $939.99 is required. I purchased the Apple MacBook Pro ME865LL/A 13.3-Inch Laptop in January 2013. Since purchasing the laptop, I have been very happy with the product. Who is this product for? The Apple MacBook Pro ME865LL/A 13.3-Inch Laptop is a helpful product for adults and young adults, specifically college students. If you are a college student ready to thrive in school, the MacBook Pro is for you. Although I mainly use this laptop for school matters, the MacBook Pro can be used for many functions. There are various application programs the MacBook Pro offers such as Firefox, iMovie, iPhoto, and Photo Booth. Also, MacBook laptops are known for being virus-free. Criteria There were three aspects I evaluated the product on: reliability, functionality, and cost. After seeing how long my mother used her MacBook Pro laptop without running into viruses or any major problems, I knew this product would be reliable. I reviewed various programs the laptop offered and how many different purposes this product can serve. You will be surprised how technologically advanced this laptop is and how its programs will be help in any situation. The item is a bit pricey but if you take into account the product’s lifespan, the MacBook Pro will save you money in the long run. For example, my mother had her MacBook Pro for eight years. It was one of the best investments she has ever made. As a result, the MacBook Pro is a money saving product. Assessment Overall, I am very pleased with this product. Since the purchase, I have not had any issues with viruses, the programs have helped me majorly throughout college, and the cost is not an issue anymore. 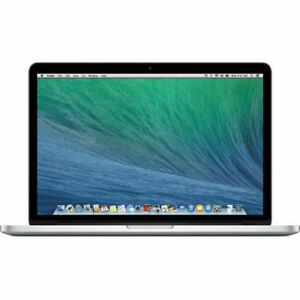 Some features that are particularly special about the MacBook Pro is the 13.3-inch LED-backlit display with 1280-by-800 resolution and Intel HD graphics 3000, battery life, two USB ports, CD/DVD drive, and the button less multi-touch mouse pad. Overall, the Apple MacBook Pro ME865LL/A 13.3-Inch Laptop is a great product. If you are looking for a reliable, well functioning, money saving laptop, then this is the perfect laptop for you. I got an awesome deal on this, it was in near perfect condition! I love my macbook pro 13" retina! I can't think of a better laptop. While I do still use windows on my desktop workstation, this macbook fulfills my need for aesthetics and RELIABILITY. While purely comparing performance and hardware specs (not including the body type, Apple is unmatched) other "ultrabooks" or small laptops can look better on paper... None of them will be free of bugs or issues, because all of them run windows and will have drivers from all sorts... This thing in terms of reliability and smooth operation is why its worth the extra money. Plus the body itself, a solid brick of aluminum? Can't find or beat that anywhere. This computer is a fantastic purchase. I do not regret the purchase of this computer. The case for it was solid besides being a little marked up on the front cover. The carrying case is fabulous and very efficient. Overall Apple in my opinion is the elite and leader in computer technology in today's world. I look forward to using this for school and music. I purchased this product because I wanted something that could handle the videos I make. I have an 11" MacBook Air and although it's an excellent machine as well I needed just a bit more screen, processor speed and memory to fulfill my needs for movie making. There is absolutely nothing I dislike about this MacBook Pro. If I had a wish it'd be that they come in real titanium in the color black. There is no comparison when it comes to MacBooks and other manufacturers laptops. To compare this laptop with any other is an insult to Apple as far as I'm concerned. Mind you, I've been a follower of Apple since my first computer in 1985...so it's not like I just jumped on the bandwagon. I still have my computer from 1985 and it still works perfect.